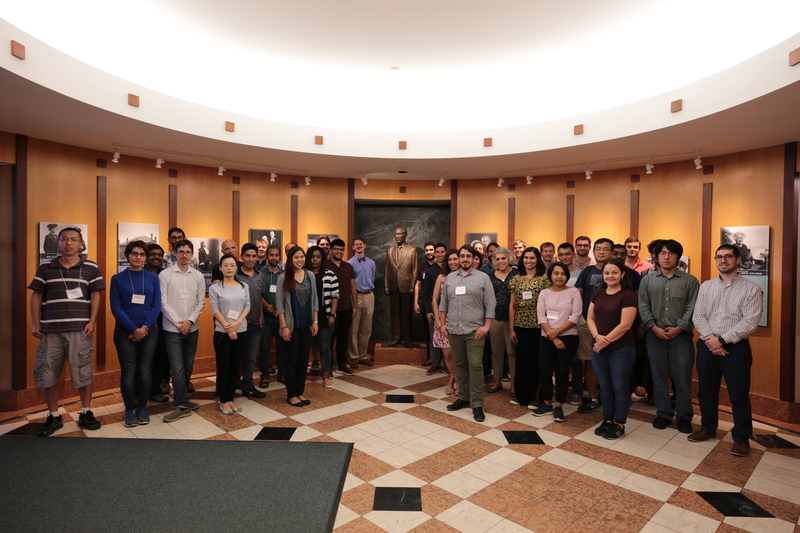 The NIH Center for Macromolecular Modeling and Bioinformatics held a five-day workshop dedicated to Enhanced Sampling Methods and Free-Energy Calculation at the Beckman Institute in Urbana, IL. The 27 participants were introduced to state-of-the-art molecular dynamics (MD) simulation techniques, such as string methods, colvars and free-energy perturbation calculation using NAMD and VMD. The workshop was designed for intermediate/advanced MD users, NAMD users in particular, demonstrating the application of advanced techniques to solve complex molecular modeling and simulation problems. During the various social gatherings of the workshop, the participants had the opportunity to expand their network, discuss personal projects with Center's staff and enjoy a small fraction of the charming Champaign downtown atmosphere. The morning lectures can be seen on the Center's Facebook page and YouTube Channel. Contact Us // Material on this page is copyrighted; contact Webmaster for more information. // Document last modified on 13 Dec 2018 // .